Looking to travel the weekends with luxuries like you have at home? Thinking about becoming a full-time RVer? This Ventana LE 3426 will have you thinking about all the places you can visit with the kids or without the kids. From having two LED TVs to watch your favorite shows, a 74" jack-knife sofa to relax on or provide overnight guests a place to sleep including on the booth dinette, to the captain's chairs that swivel for more seating, you will be amazed. The kitchen offers everything the cook will need to make meals for one person, two people or the whole gang. 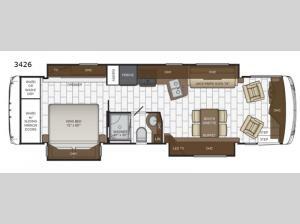 Keep looking around, the full bathroom, and the rear bedroom offer convenience and comfort, plus your own toiletries. Take a look today!